Brother's Keeper landed in the mail from Netflix per a recommendation of a friend of mine and within the first 20-minutes it was a top 10 on my list, by the end it was top 5. Call me behind the times...the piece was released in 1992, but still it is as good as the day it was born. It took me a while to put it together, but after 45-minutes or so I realized that I was watching a mix between the novels, To Kill A Mocking Bird and Grapes of Wrath in a documentary film. Uncovering a small town, backwoods life in a social rarity of human nature and taking on a court case that flushed out the uniqueness of 4 brothers who lived together in one house since birth. I found myself struck over and over with a mild sense of awe by this piece and I wasn't sure why. Set on a farm in upstate New York the brothers, having lived together in a run-down ram-shackled house or a "personal sanctuary" of sorts per the directors commentary. Wake-up one morning to find one of the four of them not breathing in bed and the facial marks that pointed to death by suffocation. Picking up on the story in a local news paper shortly after and following it from near its origin, Joe Berlinger and Bruce Sinofsky worked quickly to get the rights to film the proceeding events post the brother's death and follow the events that unfolded all the way to the courtroom. 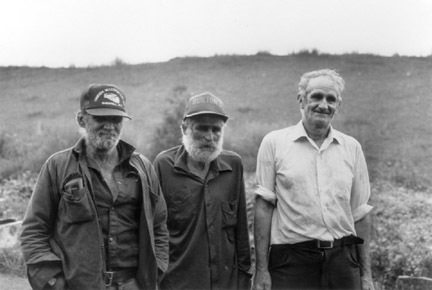 Joining in over the ensuing 1-hour and 45-minutes, the film unfolds the fascinating lives of these four brothers, the farm they grew up on, and the conflicting elements of the court case that together show just how confused the our legal system, police, and state government can get when mixing within a closed independent small town culture in the rural countrysides of a major state. Overall the average person may put this piece aside and never stop to see why it's so remarkable. Looking into this small sub-culture of society challenges one's mind's ability to understand the natural non-conformity of these four brothers and this small town to do as it sees fit with the problem at hand. For the average trained mind is far easier to dismiss them all as strange and out-of-touch, but if you look closer you will see something rare and unique that exists within us all. It's a sense of self and a sense of simplicity within a life that doesn't seek approval from a larger system of thought. It is this independence that defines these men and this towns right to make their own choices on how to deal with life and to be damned the system that thinks 'it knows best' for telling them otherwise. It is both a beautiful thing and a dangerous thing in an age of terrorism and fear of small independent groups of people. It is something that is disappearing rapidly from the public eye and it is this small glimpse into a moment that makes this film a top 5 for me. A glimpse that we may soon not be able to look into again.